Stepping out of our comfort zones and trying new things—that's what it's all about when it comes to venturing the wilds of Trader Joe's like our team has these past six years. Not that I'm uncomfortable with acai. I've been singing its praises since before this blog began. No, I'm not uncomfortable with acai as an ingredient. But when it comes in a bag pureed all by itself and I'm the one who has to figure out what to do with it—that's a challenge for me. I mean sure, there are suggestions on the packaging and there are tons of recipes and ideas online. 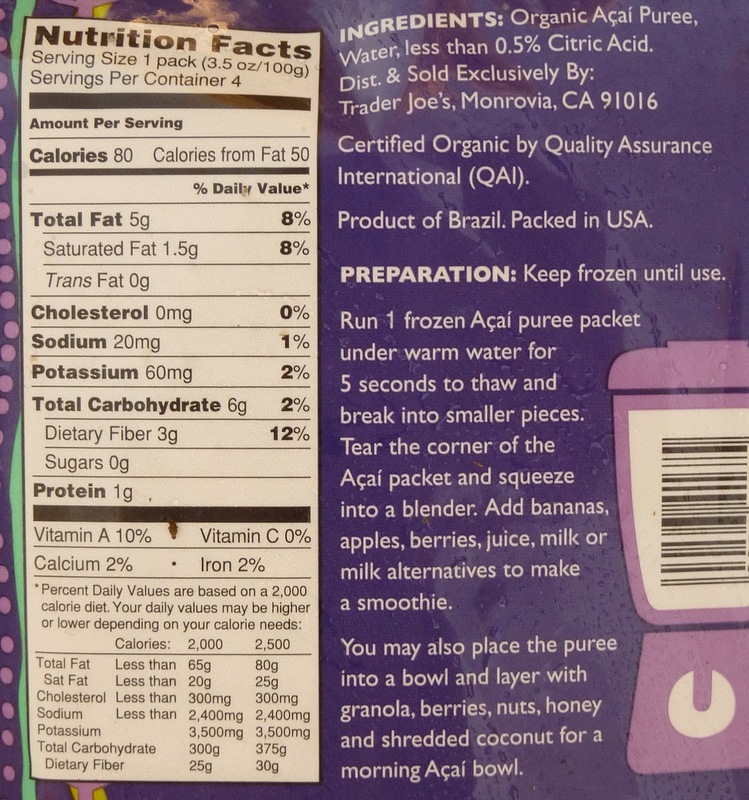 But up to this point, the acai in my world has always been pre-measured, pre-mixed, and pre-sweetened. And I liked it that way. But could I like it like this? It was worth spending $4.49 to find out. Sonia and I have been brewing up fruit smoothies in our little generic wannabe "bullet" blender as of late, and we knew acai would be a welcome addition to our concoctions, which generally feature bananas, strawberries, yogurt, almond milk or coconut milk, and agave sweetener. 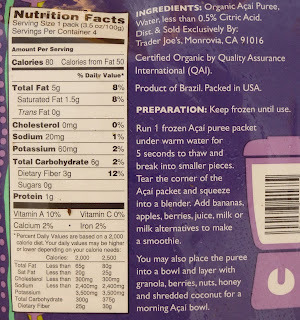 It seemed like acai would probably blend pretty seamlessly with those ingredients. But knowing the berry's properties of earthiness, natural caffeine, and high levels of fiber, there would be certain potential pitfalls associated with using too much or too little in our homemade mixtures, namely: creating a beverage that might not taste great, missing a decent amount of sleep, and/or extra visits to the bathroom. But despite these inherent risks, we dove right in to acai-land and got a-mixin'. Once thawed, the product is a fascinating purple goo. 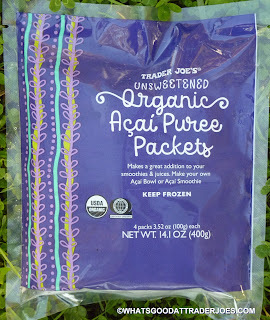 I had never tasted acai by itself before. It's far less sweet and much more earthy/nutty than I ever imagined. Those mixologists at Robek's and Jamba Juice always told me acai had a "natural chocolate-type flavor." Well, it certainly does when sweetened. But by itself, the flavor might be likened to some unusual, berry-ified bitter cocoa bean paste. If anything, our smoothies needed more sweetener than usual once we added the acai, in order to cancel out its natural bitterness. Once sweetened, however, it added a very welcome complexity to our beverages that one simply cannot achieve using more traditional fruits and berries. It wasn't quite like those store-bought mixtures or a "professionally-blended" smoothie, but it certainly wasn't bad. We never did quite achieve that chocolatey taste we've had before, but we created an interesting fruit-based beverage with a velvety texture and an inviting richness seldom attained outside an actual smoothie joint—where you'd pay upwards of $5 for a single acai drink. Both Sonia and I are finding this one a bit hard to score, since it's just a single ingredient that begs to be used with many other ingredients. 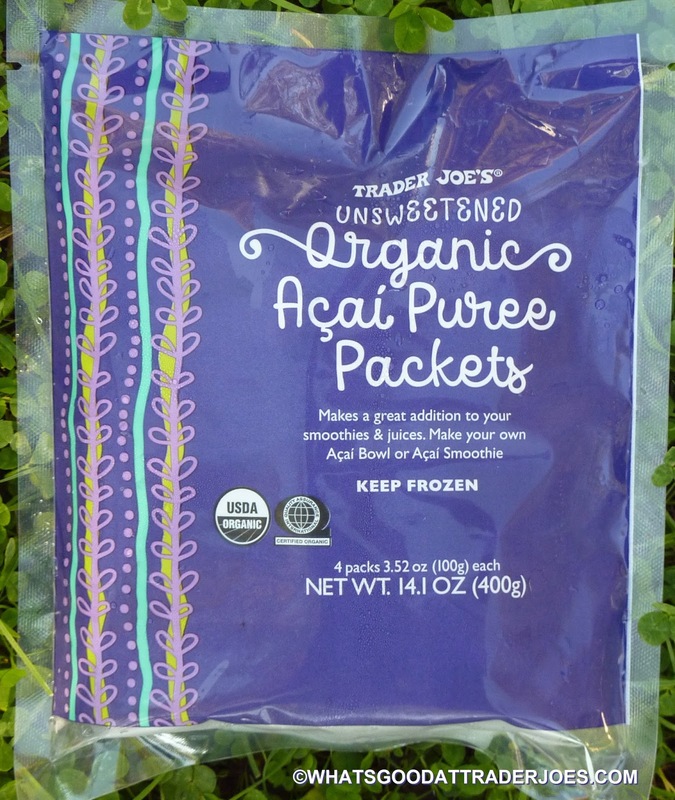 But for what it is: a convenient, relatively-reasonably priced (acai ain't cheap) exotic berry puree that can enhance your homemade smoothies and shakes, we think it deserves to be rated "really darn good." Throw the acai puree into the blender with frozen blue berries and strawberries. Pour it into a bowl and cover the top with sliced banana, strawberries, kiwi, blue berries, pineapple, a little granola and drizzle with honey. You will start craving this for breakfast or dessert. 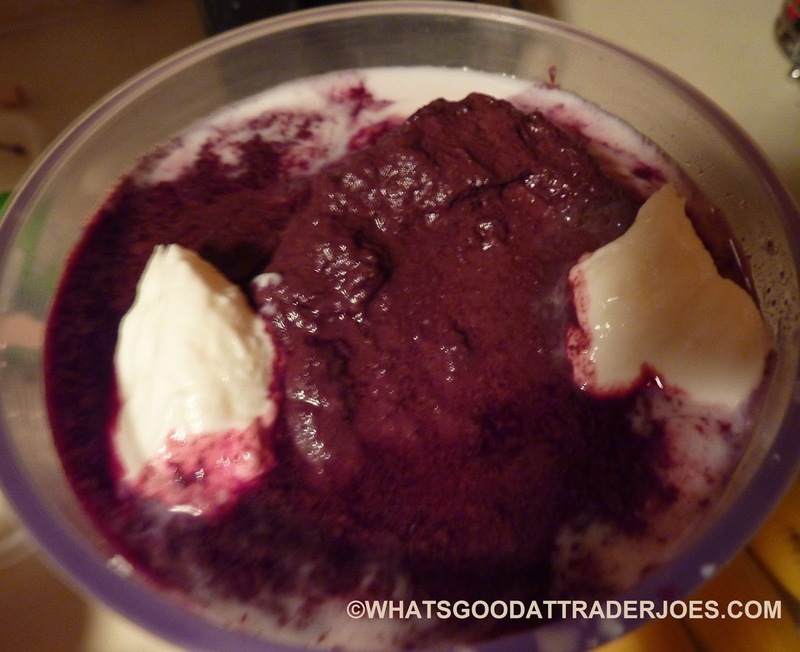 The puree just needs a bit of natural sweetener from the fruit and it's so good for you. Blend a packet with 2c of unsweetened soy milk, chocolate protein powder, 2oz frozen greens (I use TJs power greens which I steam then freeze in 2oz. portions.) SO good!